People are injured every day in Las Vegas and Henderson, but not all injuries fit into an easily defined category. The good news for you is that in Nevada, they do not have to. 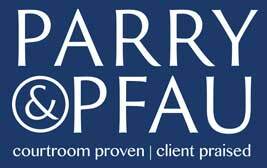 If someone else is responsible for your injuries, Parry & Pfau personal injury attorneys can hold them accountable. Call us today, and we'll walk you through your options. On average, there are just under 1,000 crashes every day on Nevada roads resulting in over 500 injuries. That's every day. Not every crash is straight-forward, and the responding officers don't always allocate fault correctly. Then the insurance company wants you to strike a deal. With an attorney, you don't have to worry about being taken advantage of. You can focus on getting better. Matt always takes the time to ensure his clients fully understand their choices and aligning those with their needs to create an excellent Family or Personal Trust. I highly recommend him and the services he offers to my clients without reservation. For an excellent and in-depth legal resource with broad coverage related to Nevada, visit the Nevada Business Law Blog.